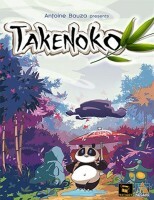 Takenoko is a game with several sound strategies and numerous routes to victory. But regardless of the strategies employed, the victor will usually be the player who succeeds in getting his/her opponents to do most of the work. The key is making this happen without them catching on to what you’re doing. While everybody is focused on getting tiles on the board early, you’ll want to make sure you draw cards to the maximum of 5. This is obvious, but more options to score is better. I prefer Panda cards in the early game, and always avoid drawing tile cards (low points, and you’ll be helping everybody by completing them). NEVER become the person that’s building 60% of the board. I always keep a running tally and make sure I’m responsible for placing atleast 1 less tile on the board than each of my opponents… because placing the tiles and growing bamboo will likely benefit everybody, so I’ll let them do it for me! You need to place a few tiles and move the gardner every couple turns lest they get suspicious… but if you keep them off your scent you’ll be set for the end of the game. As you’re getting close to the last few rounds, grab up every Gardener card that you can. If your opponents spent much of their turns building the board, there will be a bunch of fully-grown or nearly-grown stalks on the board, and these cards – the highest point cards in the game – could be completed or one move from completion when you draw them. It’s not uncommon to pull and score off a 6-point card in this manner during the game’s final round alone. The whole key here is subtlety. As long as you’re contributing something with tile placement and gardening it shouldn’t raise the flag to your opponents. You don’t want the game to become a stand-off where everyone refuses to build anything and instead stocks up on irrigation channels and improvements… but you don’t want to be the one that does 60% of the work for your opponent’s victory either. Since I’ve picked up Takenoko, the game has come out with multiple groups. And so far the best “strategy” is to read the room. If you notice that a lot of players are focusing on gardening tasks, pick up an extra panda card. This will likely allow you to quickly complete a challenge, while negatively impacting your opponents plans. See a challenger stacking up on Panda cards? Move the Panda to a place where they will not be able to reap the rewards of other’s hard work. Have a friend who likes to score multiple tile cards at once? Place a tile and choose a spot that is not likely to create a scoring pattern. Keep in mind that the other players could and should use similar strategies. If so remember the most important part of reading the room…be aware of when other’s are on to you. Once the jig is up it will be time to switch gears. Do so quickly, and possibly take a turn doing actions that help other’s reach a smaller objective. The less people fear you, the better the odds that you will be the King of the Pandas! Keep in mind that you can put down as many completed objectives as you want on any given turn. Knowing that – do not rush to put down your panda and field objectives, especially the low-scoring ones. This will deprive opponents of information to make their own decisions and will ensure that your first seven (or however many) cards give you lots of points that you can supplement. You can always play the completed tasks on your last turn. Do not do this with the gardener tasks as the bamboo heights will change too frequently, taking away the height you were aiming for. This strategy applies mostly for two player games (how I play 99% of the time), but could be useful with more players in certain situations. When working on a gardener card that requires you to grow 3 or 4 sets of bamboo, lay those tiles next to each other so that one move of the gardener will grow bamboo on multiple tiles that you need at once. Then you will be able to complete the objective faster and in fewer turns. This game is such a pleasure to play, but one thing that can mar that is an opponent laying down all five cards in their hand at the same time to trigger the last round. You can find yourself half-way to completing a high-point card or two but with nothing you can complete in the next turn. Now the final score is a blow-out. Full disclosure… I know this goes over poorly because I was the first one in my group to use this tactic… I won huge, but everyone refused to play with me again until we could house rule the fix! We now use the added rule that no player can play more than 2 cards in their turn. This way you will only have to worry about the “one turn left” part of the game when another player is 1 or 2 cards away from triggering the last round. Strategically, I completely agree with @fcofabricio… but getting people to play with you is more important than winning every time, so I’ll just work on other strategies. And knowing the game won’t come to an unplanned and abrupt end gives you time to build better strategies. When picking up new cards, grab the gardener cards for the biggest point value (usually) for your time. Quite often I find the gardener cards will take little to no work on your part, as others will inevitably move the gardener around and grow the bamboo for you. If irrigated tiles of the same color have been placed adjacent to each other, the gardener’s growing benefit will usually more than keep up with the hungry panda. If you’d like a more dynamic, cutthroat version, try the advanced variant: claimed achievements must be unique. In other words, you can’t claim an achievement if someone else has already claimed a copy of that achievement. Give each player six counters. Place these counters on the six things the dice can roll. Each turn you may use one counter and the effect under it. You can only use each counter once per fill. When the last counter is used refill all the counters. The “?” is the same, any other outcome of your choice. Don’t automatically jump on the “extra action” option if you roll a “?” symbol on the weather die. The “wind” option of doing the same action twice can be advantageous when behind in objectives because it can allow you to draw two objective cards at once and perhaps even playing one immediately! Try to avoid getting too many low point cards as the game goes on. If you happen to have one of these cards in your hand then go ahead and score it. However, don’t actively go for those cards less than 4 points. I’ve had people end the game by getting the required number of points cards AND they get the emperor card, but they still came in last because others had scored fewer cards but they were worth more. At the beginning of the game, people are going to want to build the board to get land plots and move the panda and/or gardener. Let them. While they are doing that, pick up some extra objective cards (the max you can have hidden in your hand is 5). It’s early on in the game and you’ll have lots of opportunities to secure those points, and your opponents have probably helped you get closer to achieving them anyway since they were building the board. Stay away from the plot objectives if you want to win. It takes a lot of actions to complete them including irrigating and are very low reward. They can also block your hand objectives if there’s no possibility left to complete them. Panda objectives should be preferred because they are easy to complete, have high values and you will never get stuck with them like Gardner and plots. Also in case of a tie, the player with more panda points win. A good option (also for first time players) is to play with open objective cards (more interaction) and flip them when they are achieved (less information who’s winning). You can also shuffle all the objective cards in 1 pile, so you have to take the first one on the pile if you want an extra objective card. If there’s several areas of garden that have been constructed of several like-colored tiles, it is not unlikely that a significant number of the possible tile objective cards are already complete. Use actions to pull tile/plot objective cards — especially if you roll Wind on the weather die and can take two in one round — and take a chance on the objective already being complete, for a boatload of free points that might quickly catch you up to your opponents. House Rule ~ If you didn’t help with the objective, you only get half the points. We tried playing this a couple times, and I think I like it. At the end of the game, any objectives you didn’t finish count as negative points to your score. I’ve found that the gameplay is a bit more tactical, and people tend not to load up on objective cards. Instead, there is more of an effort to score what’s in your hand, which makes everyone develop what’s on the board, unless someone draws all panda cards. I think it’s a good change of pace, and it eliminates the “someone is close to finishing, I better draw some objective cards to see if I get some easy points” approach. As I said in my review, I feel like having the chance to play a last turn gives a lot of advantage to the player who puts down the last objetive card, since she already receives 2 points from the emperor. It obviously also depends on the value of the objetives she has accomplished but in a high number of occasions in the games that I’ve played, this person ends up winning thanks to this last turn while the other players are caught by surprise with a last turn. Add some extra markers. They can be crystals, cubes, pennies, or whatever. When you add new tiles, place a marker on the tile if it is not immediately irrigated. Remove the marker when you irrigate the tile and it gets it’s free starter bamboo stalk. This way you will know whether or not you need to start a new stalk with a farmer action. This will be especially helpful in mid to late game. When the game is getting close to the end and the board is developed and you’re looking for some quick points to either stretch your lead or catch up, draw some land plot objective cards. They may not get you tons of points – or in some cases none at all – but once you draw them and they are completed, you get the points without having to take another action. I’ve found this to be very effective.